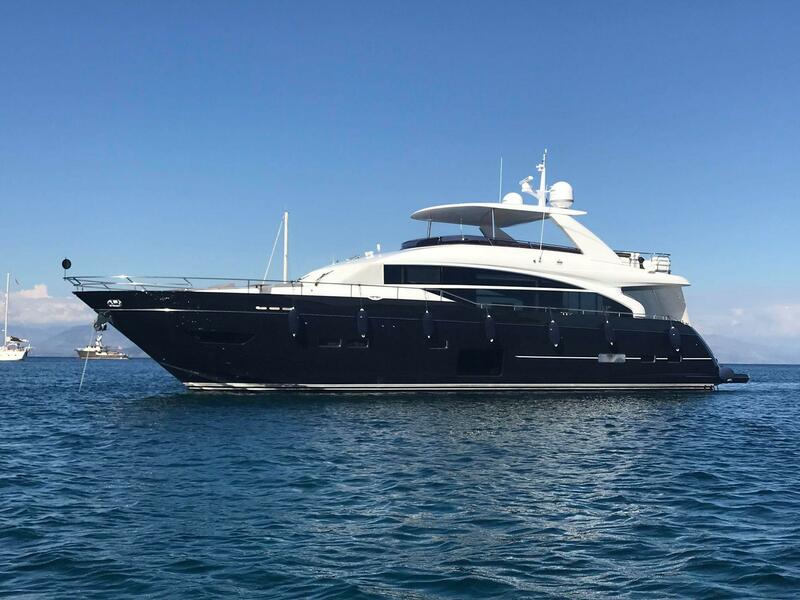 Princess Yachts, established in 1965, is a prestige boat builder of M Class superyachts, Flybridge motoryachts, V-Class sport yachts, and S-Class Sportbridge yachts. Princess Yachts defines luxury with its timeless elegance, sophistication, and impeccable build quality. A distinctive brand recognized around the world, the Princess name is part of the Moët Hennessy Louis Vuitton (LVMH) family. Worth Noting: The Princess 40 appeared in the James Bond film, "The World is Not Enough," in 1990. Princess V40 1995 -Current 41' 2" 12' 2" 3' 3"
Princess V39 2012 - Current 42' 6" 12' 5" 3' 4"
Princess V42 1998 - Current 44' 6" 13' 1" 3' 6"
Princess 43 2012 - Current 47' 6" 13' 11" 3' 9"
Princess V45 1984 -Current 47' 1" 13' 1" 3' 6"
Princess V46 2002 - Current 48' 8" 13' 2" 3' 4"
Princess V48 2005 - Current 50' 10" 13' 6" 3' 9"
Princess V50 1998 - Current 50' 10" 13' 10" 3' 6"
Princess V53 2005 - Current 53' 8" 14' 8" 4' 1"
Princess V52 2012 - Current 54' 6" 14' 7" 3' 9"
Princess V57 2012 - Current 58' 8" 15' 3" 4' 2"
Princess 56 1998 - Current 59' 5" 15' 7" 4' 3"
Princess V58 2003 - Current 59' 8" 15' 0" 3' 8"
Princess 60 1994 - Current 61' 1" 15' 10" 4' 2"
Princess V62-S 2012 - Current 63' 6" 16' 5" 4' 6"
Princess 64 2012 - Current 64' 10" 16' 4" 4' 9"
Princess V65 1999 - Current 65' 2" 16' 8" 4' 5"
Princess 68 2012 - Current 69' 9" 17' 8" 5' 2"
Princess V70 2005 - Current 70' 0" 16' 11" 4' 6"
Princess V72 2012 - Current 74' 0" 17' 8" 4' 10"
Princess S72 2012 - Current 74' 0" 17' 8" 4' 10"
Princess 23M (75') 2003 - Current 75' 0" 18' 0" 5' 0"
Princess V78 2009 - Current 78' 2" 18' 9" 5' 5"
Princess 82 2012 - Current 83' 7" 18' 10" 5' 9"
Princess V85-S 2012 - Current 85' 3" 20' 7" 5' 11"
Princess 88 2012 - Current 88' 0" 20' 9" 5' 10"
Princess 95 2007 - Current 95' 0" 23' 2" 6' 0"
Princess 98 2012 - Current 98' 10" 23' 2" 6' 0"
Princess 30M (100') 2014 - Current 100' 0" 23' 1" 6' 0"
Princess 35M (115') 2012 - Current 115' 4" 23' 11" 6' 6"
Princess 40M (131') 2012 - Current 131' 9" 26' 4" 7' 6"
David King founded Princess Yachts as Marine Projects Ltd in 1965 in England. 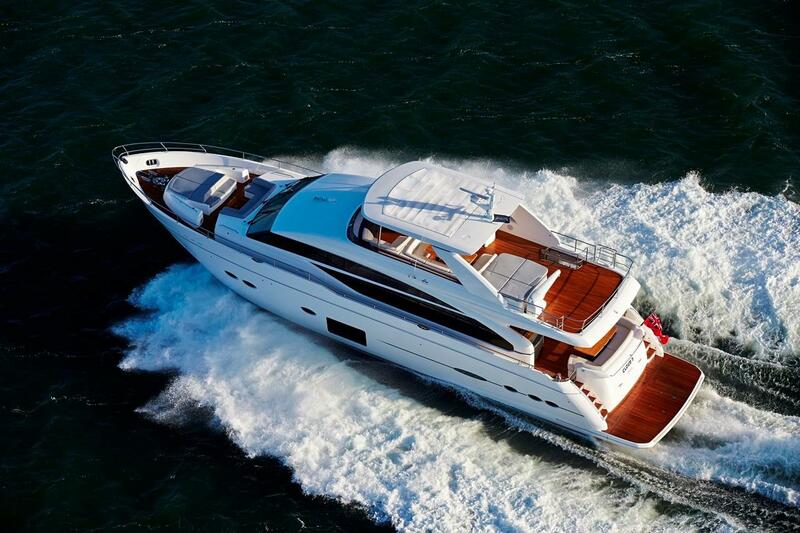 The company was officially named Princess Yachts International in 2001. With 50 years of yacht building experience, Princess Yachts has grown to be an industry leader and regarded for its contemporary yacht design, which embodies hand-crafted, hand-finished detailing. 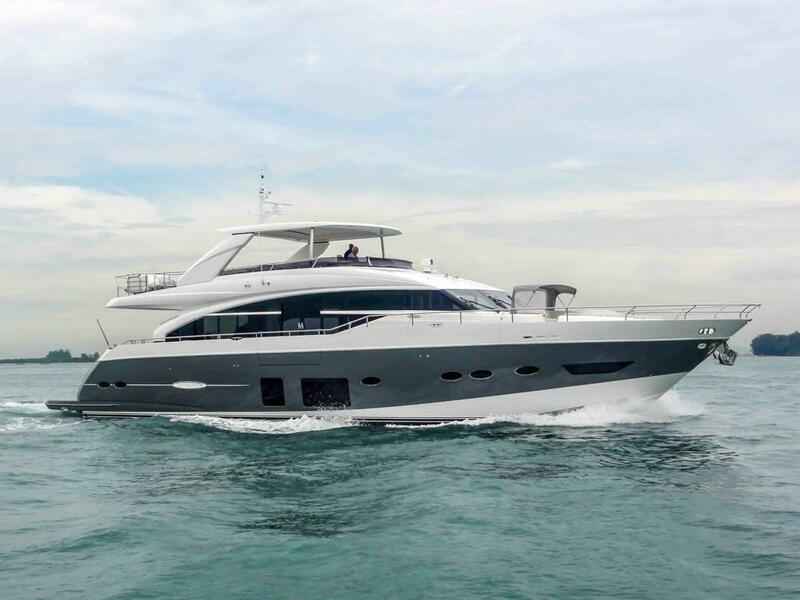 Combining innovative technology and elegant design, Princess has been an active partner in technology working groups and has expertise in resin infusion, which reduces weight and increases fuel efficiency and hull performance. 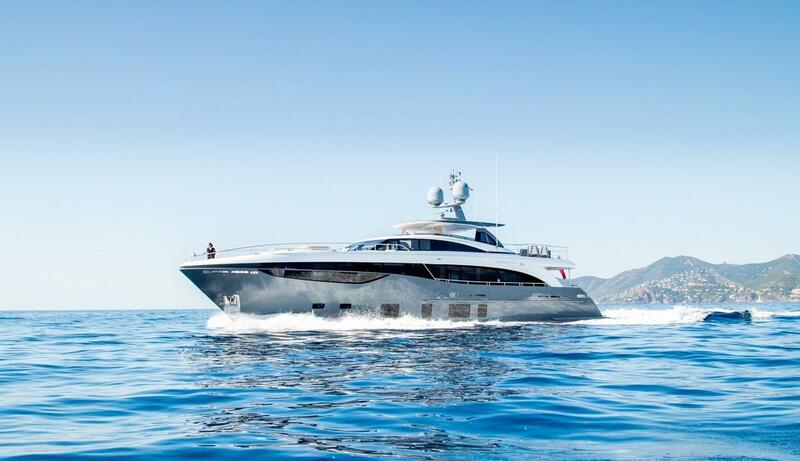 Princess Yachts has been the recipient of numerous awards and recognition over the last several decades. In 1982, the Princess 45 became the largest production motor yacht in the United Kingdom. 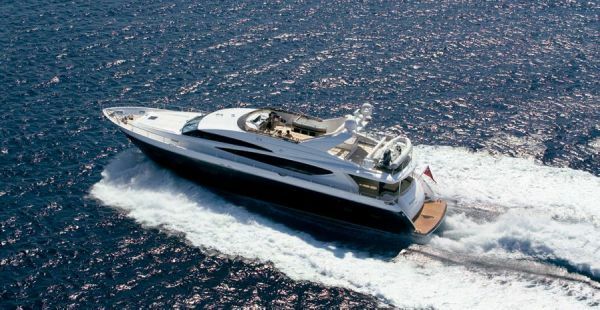 In 2012, Princess was recognized as the first major European motor yacht manufacturer to be awarded ISO14001 for its efforts of reducing the effect on the environment. 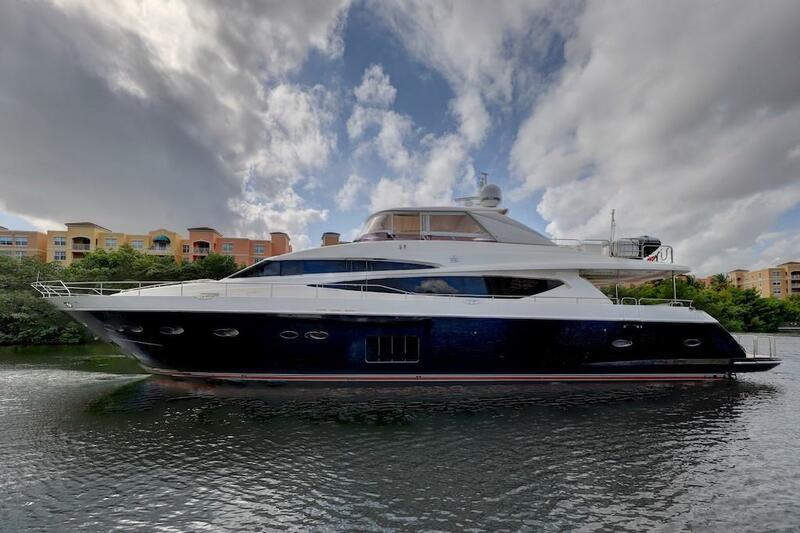 The Princess Yacht model line is comprised of M Class Superyachts, Flybridge Motor Yachts, V Class Sports Yachts, and S Class Sportbridge Yachts, with lengths ranging from 39 to 130 feet.